Laser Hair Removal Experience with De Hair ! Do you have any concern about unwanted hair? Perhaps most of women did. I'm personally okay with hair on my arm or legs since they are pretty thin and slightly invisible. The only area that I concern is my underarms. The hair around my underarm area is not thick to begin with but still it is visible especially if I'm wearing sleeveless tops. It is very disturbing when I need to regularly shave or wax every time I want to wear sleeveless clothes. Besides, it is painful and hair tends to grow thicker than before which is another nightmare for girls. That's why I always curious with permanent hair removal. 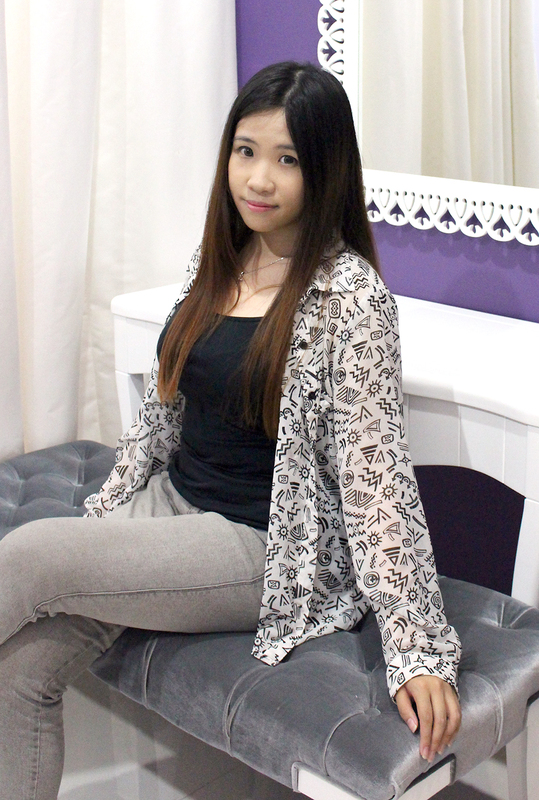 Last month, KBJ and De Hair kindly invited me to try on their laser hair removal treatment. I was so excited since I never tried this kind of treatment before. 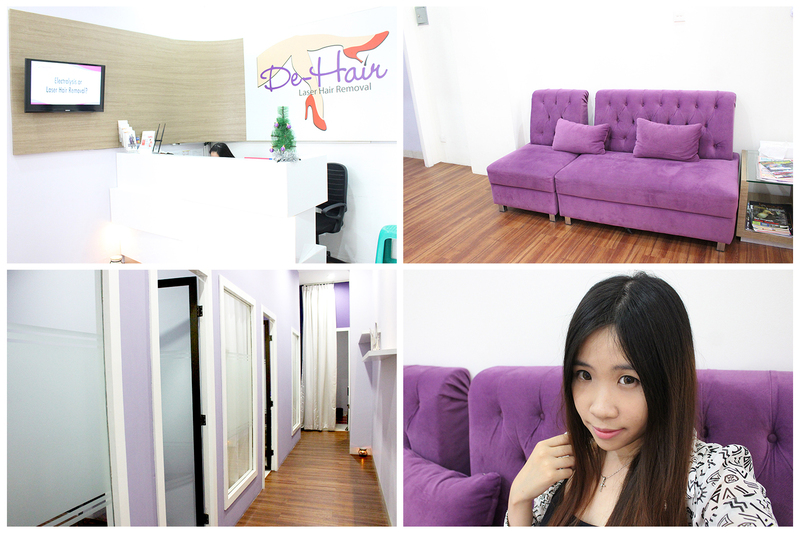 I make an appointment and visited De Hair Laser Treatment at Mall of Indonesia, Kelapa Gading. I do recommend you to call and book an appointment before you come, especially on weekend. The treatment room is pretty spacious and they gave us a sleeveless top to change into. They will also give you a pair of glasses before doing the treatment. The process is pretty similar with IPL. First, the targeted area will be shaved and the therapist will start applying a thick of cooling gel. If you're wondering what is the difference laser with IPL, so here it is. The therapist will set a certain amount of laser power for certain amount of time and they will continuously rub the targeted area with laser. Talking about pain, it is painful. Not literally so much pain that will make you scream but do not expect the tiny ant bites just like when you're doing IPL. I feel sort of burning and tingling sensation in the middle of the process. The pain last me several days before it completely gone. Honestly, I was pretty horrified with the process and kinda afraid to try on laser treatment in the future. It has been around a month so I think it is the right to see the treatment results. I am totally impressed. The amount of hair have been reduced like 75%! No kidding and it was only one treatment. Seriously, I am very impressed. I don't even notice that I rarely shave for this last one month. There are several strands of hair growing but it is completely unnoticeable since it grows thinner than before. Compared to several IPL treatment that I've been trying before, this laser treatment gives an obvious result, so all the pain I've been gone through is actually paid off. However the other downside comes from the service. I feel that the therapist didn't communicate a lot to explain about the whole process so I feel like totally clueless and have no idea about what's going on while doing the treatment. They don't even explained what is the after treatment DOs and DON'Ts until I come with tons of questions. Not even asked about whether I have allergies, or my previous treatment history which mostly would be asked. 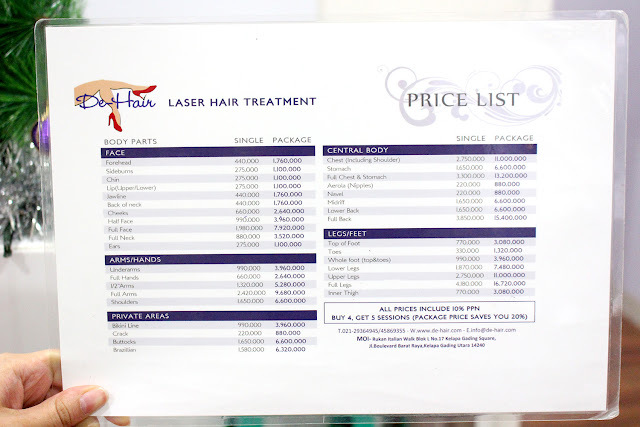 I don't know if the standard for laser hair removal is different but I think the service could have been done better. Here's the price list of the treatment. The treatment is quite pricey but I think the result is very satisfying and worth to try. Highly recommend this treatment for those who want to get rid of unwanted hair and see a noticeable results in one go.